The Datalogic QuickScan Lite QW2100 offers a great combination of performance and affordability, great for smaller retailers, libraries, or office asset scanning. It is built as a cheap barcode scanner, but the QW2100's scanning capabilities compare well to more expensive counterparts. As a linear imager, the QW2100 reads retail barcodes from contact to over a foot away, making it easy for users of all skill levels to scan successfully. The wide scanning angle, combined with the thinner and brighter scanning line, ensures faster and easier scanning of most 1D barcodes. An optional stand gives you presentation scanning from a variety of angles. The lightweight QuickScan QW2100 has been built to withstand the bumps and accidents you may experience in a retail or light industrial setting. Rubberized overmolding on the scanner protects it from drops of five feet to concrete, extending its lifespan dramatically. An IP42 seal keeps dirt and some water splashes from harming the components as well. Shipping with a 3-year warranty, the Datalogic QuickScan QW2100 provides many years of reliable service. Scan Rate (Maximum) 400 reads/sec. The QuickScan Lite is lightweight and pretty easy to use. It reads UPC barcodes incredibly quickly, so we think it'd be a great fit in retail operations such as sporting goods or souvenir shops. We have noticed sometimes the optimal scan spot is a little right of center, but otherwise it provides good reads at a great price. Find it faster! Click here to compare QuickScan Lite QW210 (...) models by feature. Hi this is Travis with POSGuys.com. Today we're taking a look at the Datalogic Quickscan Lite. This is the new budget friendly version of the Quickscan. It is similar to the three other Quickscans out there; the Quickscan Imager, the Quickscan Laser and the Quickscan Wireless, however this one is a little bit more budget friendly because it comes in at around $100 dollars. 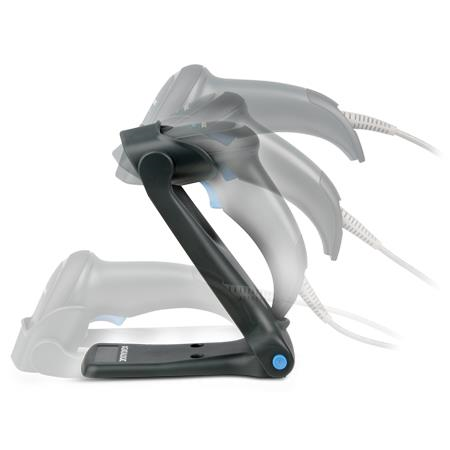 It is a great economical option if you are looking to purchase multiple barcode scanners and you are trying to save some money and on a budget. It has many of the same features as the more advanced versions but it comes in at a little better price. Taking a look at the scanning capabilities of the Quickscan scanner. It does great job with your standard 1D barcodes. So your 3 of 9. Your code 128 and UPC. It actually gets down to a pretty tight mil and right here I'm on a six mil UPC which is really tight your not going to see that anywhere except in maybe high end cosmetics where they are really trying to hide the barcode. Your standard sizes it is fantastic with. You also can see the aiming system. It is a single red line. It is thicker than a laser scanner but it is not as wide as some imagers and then when you scan a correct barcode. You get that little green dot. It is a nice visual feedback if you are in a loud environment where you might not be able hear the beeps which you want to make sure that scanned than you can just look for that green dot. So a good feature overall. The scan range on the Quickscan is good from almost contact about an inch away out past a foot to about 18 inches. That is on standard UPC. On an enlarge barcode your scan range is even further. You're going to go past the 18 inches out several feet. 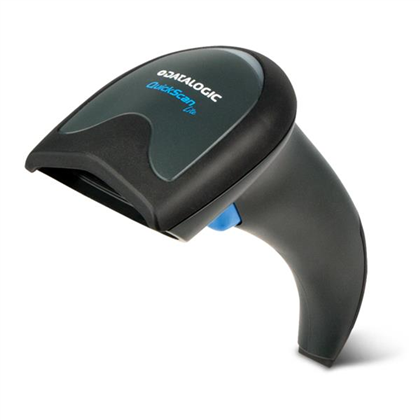 If you're in the market for a budget friendly barcode scanner take a look at the Datalogic Quickscan Lite. It has a five year warranty and an IP42 seal and it has green dot technology to help with aiming. 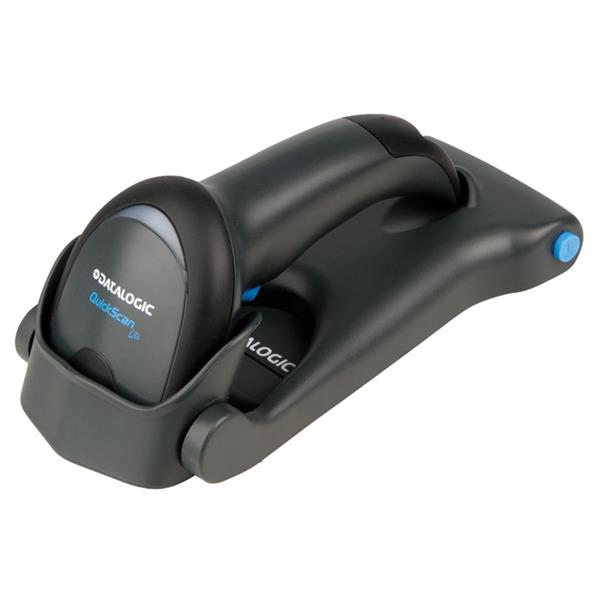 It is a great overall barcode scanner and quantity discounts are available if you're purchasing ten or more. For more information on the Quickscan Lite or to purchase please visit us at www.POSGuys.com. Thanks!